Households that cut down on food waste could save £470 a year, according to a new campaign. Zero Waste Scotland hopes to save consumers almost £40 a month by "buying smarter" and recycling any food that cannot be eaten. The campaign claimed people threw away about one fifth of the food they buy every year. In Scotland this creates about 630,000 tonnes of waste which gives off harmful greenhouse gases. The Scottish government has already pledged to cut greenhouse gas emissions by 42% by 2020 and 80% by 2050. This includes a ban on food waste from landfill sites by the end of 2020. The Environment Secretary, Richard Lochhead said: "If we used up all the food and drink we currently waste, it would cut carbon emissions equal to taking one in four cars off Scotland's roads." Zero Waste Scotland said the best thing households could do would be to reduce the amount of food thrown away. 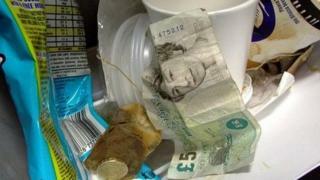 It also hoped to encourage Scots to recycle the food they could not use, such as banana skins, bones and tea bags. Food waste collection services can now be found in more than 50% of the country and where they are not available, Zero Waste Scotland urged people to try composting at home. Iain Gulland, director of Zero Waste Scotland, said: "Recycling food waste can also generate renewable energy and be turned into a fertiliser to benefit Scottish farmers." The campaign comes a month after new waste regulation rules made it compulsory for all Scottish businesses to recycle key materials including food waste.